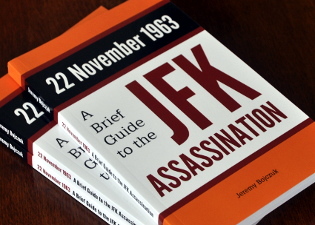 You are here: Home › Further Reading › JFK Assassination FAQs › Why Did Lee Harvey Oswald Kill JFK? Why Did Lee Harvey Oswald Kill President Kennedy? The Warren Commission claimed that Oswald acted for a variety of psychological reasons, although there is plenty of evidence that the alleged assassin in fact thought highly of President Kennedy. One of the problems facing the Warren Commission was the difficulty of establishing a credible motive for Lee Harvey Oswald as the lone assassin of President Kennedy. Only a small part of the Warren Report dealt with the facts of the JFK assassination. The majority of the 900–page Report was devoted to a biography of Oswald, in an effort to show that he was capable of doing what he was supposed to have done. Michael Paine, who took Oswald to a meeting of the American Civil Liberties Union, claimed that Oswald “thought President Kennedy was doing quite a good job in civil rights, which was high praise coming from Lee“ ( Warren Commission Hearings and Exhibits , vol.2, p.399). Lillian Murret, Oswald’s aunt, reported Oswald’s opinion of Kennedy: “he said he liked him” ( WCHE , vol.8, p.153). Samuel Ballen, who interviewed Oswald for a job, stated that “I just can’t see his having any venom towards President Kennedy. … this is an individual who felt warmly towards President Kennedy” ( WCHE , vol.9, p.48). Paul Gregory, a speaker of Russian who knew the Oswald family in Dallas, said that Oswald “expressed admiration of Kennedy. … I never heard him say anything derogatory about Kennedy. He seemed to admire the man … he always expressed what I would interpret as admiration for Kennedy. … I remember in their apartment that we did look at this picture of Kennedy, and Marina said, ‘He looks like a nice young man,’ and Lee said something, yes, he is a good leader, or something, as I remember, [it] was a positive remark about Kennedy” ( WCHE , vol.9, p.148). George de Mohrenschildt, who befriended the Oswalds, claimed that Oswald “was an admirer of President Kennedy. … I mentioned to him that … I thought that Kennedy was doing a very good job. … And he also agreed with me: ‘Yes, yes, yes; I think [he] is an excellent President, young, full of energy, full of good ideas’” ( WCHE , vol.9, p.255). Francis Martello, a police officer who interviewed Oswald in New Orleans, claimed that “he showed in his manner of speaking that he liked the President.” Martello was asked whether Oswald “demonstrated any animosity or ill feeling toward President Kennedy,” and replied, “No, sir; he did not. At no time during the interview with Oswald did he demonstrate any type of aggressiveness” ( WCHE , vol.10, p.60). The Warren Commission was unable to find anyone who claimed that Oswald disliked President Kennedy. His avowed commitment to Marxism and communism, as he understood the terms and developed his own interpretation of them; this was expressed by his antagonism toward the United States, by his defection to the Soviet Union, by his failure to be reconciled with life in the United States even after his disenchantment with the Soviet Union, and by his efforts, though frustrated, to go to Cuba. Oswald seems to have had no more than an occasional vague distrust of authority. He had been a relatively obedient member of the Marines for several years. His well–documented behaviour in New Orleans in the summer of 1963, together with other aspects of his interesting career, shows little evidence of anti–authoritarian impulses. His surviving notes for a speech, which may or may not reflect his genuine opinions, criticise both the Soviet system and western capitalism, but those criticisms are not much different from the opinions of most reasonable people, and do not illustrate any “deep–rooted resentment”. This seems to be the motive that the Warren Commissioners themselves found the most persuasive. After the final meeting of the Commission, one of its members, Senator Richard Russell, was asked by President Johnson about Oswald’s motive. Russell replied that “he was a general misanthropic fellow … he had a desire to get his name in history and all” (see Richard Russell and the Warren Report ). There is no evidence to support such a notion. Oswald himself never expressed a “desire to get his name in history and all”. Nor did he ever boast of killing Kennedy. On the contrary, over the two days between his arrest and his murder by Jack Ruby, Oswald consistently denied any involvement in the assassination, famously claiming that “I’m just a patsy” ( WCHE , vol.20, p.366; for more examples of Oswald’s repeated proclamations of innocence, see Sylvia Meagher, Accessories After the Fact: the Warren Commission, the Authorities, and the Report , Vintage, 1992, pp.246–9). Oswald was almost certainly not one of the two men who attempted to shoot General Edwin Walker in April 1963. General Walker himself pointed out that the bullet which had almost killed him was not the same type as the bullets fired in the JFK assassination, and thus cannot have been fired from the only rifle which could be attributed to Oswald. An “avowed commitment to Marxism and communism” is hardly compatible with what is known about Lee Harvey Oswald’s career, which suggests very strongly that he was employed in various capacities by one or more US intelligence agencies. The Warren Commission was aware of the widely held belief among journalists in Texas that Oswald was a paid informer for the FBI. The Warren Commission went out of its way to conclude that Oswald’s motives were purely psychological, and that even though he had an “avowed commitment to Marxism and communism,” the alleged assassin was not part of a communist conspiracy. Indeed, the Commission was set up precisely to defuse rumours of a communist conspiracy. a few weeks before the assassination, Oswald had apparently visited the Soviet and Cuban diplomatic compounds in Mexico City, where he had attempted to obtain a visa to enter Cuba. or their political enemies had falsely implicated those regimes. These theories threatened to increase the public’s distrust of political institutions. Two days after the assassination, an incident occurred that allowed Washington insiders to repair the damage. Oswald’s murder by Jack Ruby ensured that none of the evidence in the case would be subject to critical examination at a trial. The public must be satisfied that Oswald was the assassin; that he did not have confederates who are still at large …. We need something to head off public speculation. A few days later, the Warren Commission was appointed. Even though the assassination had not yet been investigated, the Commission’s conclusions were already in place: Oswald was guilty, and he had killed Kennedy alone and with no ideological motive. The absence of a credible motive suggests that the question, ‘Why did Lee Harvey Oswald kill President Kennedy?’, is the wrong one to ask. A look at the evidence makes it clear that Oswald cannot have had any motive for killing JFK, because he almost certainly played no active role in the assassination. Oswald almost certainly did not fire a rifle on the day of the assassination (see Oswald’s Rifle and Paraffin Tests). It has been clear for several decades that the JFK assassination was not the work of a lone nut. The obvious failure of the single–bullet theory shows that more than one gunman killed President Kennedy. It is almost certain that Lee Harvey Oswald was not one of those gunmen, and that he cannot have had any motive for killing JFK.